Volunteers existed from ages and they still do, just that earlier there wasn't much to yell about it. From Jesus Christ, who volunteered to go on cross for others' sins, to Lord Rama, who lived in forest for 14 years. But here I am talking about someone who contributed deeply to the cause he supported, Hanuman. Veera Hanuman is found in the epic Ramayana with Lord Rama, incarnation of Lord Vishnu. He was a loyal friend to King Sugreev and a dedicated devotee of Lord Rama. Hanuman is the main reason why Vibhishana, brother of Raavan, agreed to be on the right path which Raavan refused to take. Each person will have a different cause which s/he supports, and for Hanuman it was Lord Rama and his devotion to the Lord. I saw few amazingly distinct Volunteering activities by Hanuman in Ramayan, where cause was more important than himself. As explained in Ramayan, Hanuman jumped across the ocean to Lanka with Ram's ring to pass the message to Sita. Lanka was a highly protected territory of Raavan. His attitude towards the cause he supported is very important. When he had to support his cause even the ocean itself was of smaller distance to cross and Lanka wasn't dangerous. This is an example for all of us who say, "It's too far, that's why I didn't make it. If the cause is important then distance never matters." Hanuman wasn't able to identify the medicinal plant Sanjeevani when it was critical for Lakshman, brother of Lord Rama to get back to life. He had no other choice, so he brought down the whole of Mountain Rishabha to his Lord. There is no extent when it comes to support your cause; the limit is sky if it is truly your cause. Only a true volunteer can go beyond the limits to support the cause. 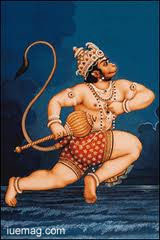 Hanuman preached about his Lord, he served his Lord and he protected his Lord. There were few instances in Ramayana where Hanuman protects Rama and people related to him. Even when Lord Rama's sons Luv and Kush were away in forest, with their mother Sita, Hanuman protected them. This clearly tells us that we need to be protective about our cause and that will come from depth of our heart only when we own the cause and that's the way we can differentiate between time passers and true volunteers. Let this be a motto to all volunteer clan - create awareness, serve and protect your cause. 4) Last but not least Hanuman lived in woods not in a palace. Rama had a kingdom and even after being the best and the closest devotee of Rama, Hanuman refused all those privileges. Let's not expect anything for the service we do. If you expect returns then you are not a volunteer. Dictionary says that volunteer is a person who freely offers to take part in an enterprise or undertakes a task.